Kagawa Five Arrows (B2 League) strengthened their roster with addition of 25-year old American center Eric Thompson (204-109kg-93, college: Pacific). He started the season at Hiroshima Dragonflies. 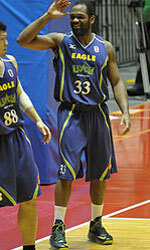 In 30 B2 League games in Japan he recorded 11.8ppg, 10.3rpg and 1.6apg this season. Good year as he was selected League Player of the Week. The last summer Thompson played at Hefei (NBL) in Chinese league where in 25 games he averaged impressive 23.0ppg, 20.0rpg (leader !!!) and 1.6apg. A very good season in his career as he was voted to Asia-Basket.com All-Chinese NBL Honorable Mention and League Player of the Week (2 times). Thompson has played previously professionally in Germany (ETB Wohnbau) and Switzerland (Swiss Central). He attended University of Pacific until 2016 and it is his third season in pro basketball.